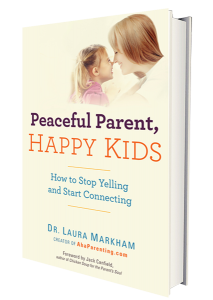 Dr. Laura Markham of Aha Parenting is offering our readers a giveaway of her book Peaceful Parent, Happy Kids: How To Stop Yelling and Start Connecting. It takes a lot of work to keep myself in check as a peaceful, supportive parent. When I do veer off course, my daughter is sure to remind me of the error of my ways. For days on end. Days. On. End. Impatience and raising my voice does NOTHING to strengthen my relationship with my daughter. I read and research. A lot. I have read all of the gentle parenting resources out there. I have taken a little of this and a little of that and tried to bring it together into a parenting style that works both for me and for my daughter. Yet, I still have not perfected the art of patient parenting. I have been waiting anxiously for Dr. Laura Markham of Aha Parenting to write and release a book on peaceful parenting. I love her blog. I find myself nodding vigorously to every post she writes. Her words always give me pause. I digest them. I put them into action. And yet, I knew that she was holding back and had so much more to offer! Enter Peaceful Parent, Happy Kids: How To Stop Yelling and Start Connecting. This is THE book that was missing from my repertoire of gentle parenting resources. This is THE book that I read two times in a row while barely coming up for air. The is THE book that has actually showed me, in a palatable manner, how to be the patient, non-voice-raising mama I knew I could be. Based on the latest research on brain development and clinical experience with parents, Dr. Laura Markham’s approach is as simple as it is effective. Her message: Fostering emotional connection with your child creates real and lasting change. When you have that vital connection, you don’t need to threaten, nag, plead, bribe — or ever punish. If you’re tired of power struggles, yelling and searching for the right “consequence” look no further. You’re about to discover the practical tools you need to transform your parenting in a positive, proven way. Peaceful Parent, Happy Kids might seem like a lengthy book at first glance, but it is divided into three sections, which makes it much easier to digest. Each section is broken down further into pointed topics which are designed to help you master peaceful parenting. The division of topics is perfect, giving the reader the opportunity to let the research, the advice, and the real-life application techniques soak in. There are so many things I enjoyed about this book. First, while Dr. Laura does not talk down to the reader, she doesn’t present information in some esoteric, can’t-wrap-your-brain-around-it way, either. She is clear and gentle, yet effective in the research and methodology she outlines in the book. Basically, she speaks to your heart in a way that gets it to open up without making you feel horrible about your past shortcomings as a parent. Second, this book is designed to be used for a long time! Parents of toddlers will benefit just as much as parents of elementary-school-age children. In fact, the earlier you read this, the more of an opportunity you have to use it as your child grows! Dr. Laura has several sections that she breaks down further based on the age of your child. I love this because as every parent knows, there is NO one-size-fits-all approach to parenting children as they move through various developmental stages. Each age and stage comes with its own unique set of challenges and opportunities. Dr. Laura has given parents the gift of learning how their parenting can evolve alongside their children’s growth and development. My advice is to read the book cover to cover before attempting to implement any of Dr. Laura’s techniques. As you go, dog-ear what resonates with you, perhaps focusing on those areas you really need to troubleshoot within your parenting arsenal. (That is a nice way of saying “dog-ear the sections that you are having parenting failures with!”) Then go back and dig deep. DEEP! Don’t take shortcuts. Don’t try to rush anything. Take what Dr. Laura suggests and deliberately begin making the changes you feel in your gut you need to make. Then watch your relationship with your child bloom like you never thought it could. Because it will based on my experience. And now to address the burning question … How did this book change who I am and how I parent! As I mentioned before, I read this book cover to cover. I then went back and took a great deal of time with those sections that I felt in my gut would help me become an even better parent than I was. I knew my areas of weakness, but after reading Peaceful Parent, Happy Kids, I also learned how who I am inherently encroaches on and limits me from being the parent I envision myself being. For me, Part One, Regulating Yourself, was the most important section. By understanding “me” and who/how “I” really am as the only thing holding myself back from being the parent I want to be, I was able to come to this whole new awareness of why I fail to remain patient when I need to be and why I allow myself to raise my voice more often than I would like. It has nothing to do with my daughter and everything to do with me. While my mind knows that my daughter is simply being a child, my heart sometimes forgot this. It wasn’t intentional, as Dr. Laura points out, but instead, it is the culmination of not paying real attention to what I am feeling, not moving past some ignored wounds from my childhood, and not giving myself the permission and time to destress. Stress is probably my biggest weakness. I let myself get stressed and angry over a lot more than I should. I turn mountains into molehills, which is part of who I am and have been since birth. All of this self-imposed stress only leads me to get upset. Dr. Laura offers the reader a three-minute process to shift yourself from upset to peace. At first I chuckled because I have tried this sort of practice before. It never worked. Ever. But Dr. Laura’s approach is different. Better. More in line with what I (and in my opinion anyone) is capable of doing. Her process is very forgiving, which makes it doable. I would love to share it here, but instead I will leave you hanging so you go and get this valuable resource! Something else that this book taught me is the importance of self-care. I put myself last. Always. I never take time for me. My daughter lives in my back pocket. When I do have a few child-free hours, I spend them working. I don’t spend one iota of time taking care of me. After reading Dr. Laura’s view on how a lack of self-care and inner work affects parenting, I have since changed how I view my worth in relationship to my family’s needs. If I do not take care of me, I cannot take care of anyone else. Yes, it really is that simple, although Dr. Laura gives a lot of practical advice on how to fit self-care into your life. Part Two, Fostering Connection, is a treasure trove of information on how to build and maintain a deep relationship with your child based on love, trust, respect, security, and independence. Dr. Laura addresses everything from the daily challenges of getting out the door with your child to getting him or her to bed. She also tackles things like how to listen as a parent and what to do when your child shuts you out. My favorite part of this chapter was actually the section on “How do you know when your relationship with your child needs work?” I think a lot of parents are clueless about this. I know my daughter’s “tells” for when we are losing our connection, but Dr. Laura brought up some good points that had me rethinking a few things. In Part Three, Coaching Not Controlling, Dr. Laura REALLY unlocks the secrets to becoming the best parent you can be in the most genuine and gentle manner possible. It is extremely important to have a solid understanding of your child’s emotional intelligence based on his or her age, and Dr. Laura breaks this down from newborns to children as old as nine years old. Even though I thought I had an understanding of this, Dr. Laura shed some new insight on exactly how much and in what manner our children can process their emotions. This is a key section for parents to really take their time understanding. Dr. Laura offers a lot of actions guides in this chapter which I appreciated! Her approach to helping parents master the basics from the ground up is palatable and empowering. After reading the various action guides, you really want to try to do this gentle parenting thing! While it IS work, the parent is eased into making changes with a solid understanding of the “why” portion of it. After reading and implementing many of Dr. Laura’s approaches, I can honestly say that I have become a MUCH more patient person and parent. I have only raised my voice once in two weeks, and honestly it was warranted. (My daughter was running through the house with poop dripping from her bottom, and I was trying to get her to stop where she was!) The interesting bonus to implementing Dr. Laura’s suggestions is that I have also become a more patient wife and a better listener. Seriously. My relationship with my daughter has changed. My mom even commented that it seemed like our connection had deepened and that a different intensity to our love unfolded. I see this. I hear it. I feel it. My daughter now tells me at least 30 times per day how much she loves me. It is a genuine expression of love and not one to keep me from hollering at her over nothing. My daughter has also become an active part of team “keep mommy in check,” allowing me the space to breathe, collect myself, and re-approach a difficult situation. Peaceful Parents, Happy Kids is honestly the best parenting book I have ever read. I will be using this over the course of the next six years (as my daughter is already three) to continue to grow and stretch myself as a parent. I truly believe that every parent needs this out on their counter to refer to as often as needed! You can purchase your copy of Peaceful Parent, Happy Kids on Amazon either in paperback ($10.20) or on Kindle ($9.95). For your own chance to win a copy of Peaceful Parent, Happy Kids, enter by leaving a comment and using our Rafflecopter system below. The winner will receive one paperback copy via mail. Contest is open WORLDWIDE. MANDATORY ENTRY: Visit Aha Parenting and listen to Dr. Laura’s short introduction to the book. Leave a comment on this post, letting us know what you learned and why you are interested in winning a copy! You must enter your name and email address in the Rafflecopter entry system for your entry to count, after leaving a comment on this blog post. Contest closes December 15, 2012, at 11:59 p.m. Eastern Time. 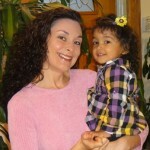 Jennifer is a former government recruiter turned stay-at-home mama to a precious daughter, Tiny, brought earthside in March 2009. She is passionate about conscious and gentle parenting, natural health and wellness, holistic healing, real foods, coconut oil, and a Waldorf approach to education. Jennifer believes that it is extremely important for mothers to have a strong network of support and to that end has been active both in her local support networks as well as online support networks. I am a mom of 3, and there are days where it seems like all I do is raise my voice or yell. I am so tired of that. I have read RAising your Spirited Child and Easy to Love, Difficult to Discipline. I gained many tools to help me but I feel like there is more, that I am missing. Maybe this book has it? I’m a reader auf Laura’s Newsletter and love her tipps and ideas for oartenting! I have 6 children and newly pregnant with our 7th. There will be an 11 yr gap between this new one and my last. When I get stressed, I yell. By reading and implementing what is in this book, I can change that. I need to change this! How to spoke to my 4YO without yealling! I love the “not trying to CONTROL your child” idea… definitely something I can learn from this book. I’ve followed Dr. Laura since having my 20month old, and learned so much! But, I still would love to read to book to improve my ability to regulate my own emotions. I was raised in a family with lots of yelling, and I want to do better for my own child… but I have trouble staying level-headed at times and I end up walking away from the situation a lot. I’m hoping this book can help me parent my child with gentleness. I love Dr. Laura! Her distinction between authoritarian and permissive parenting really gave us something to hold onto as first-time parents and I cannot wait to read this book! I am a big fan of Dr.Laura’s and a subscriber to her site for a while now. I believe in gentle, loving parenting and often speak to parents struggling with keeping their cool with their young kids. I would love a copy of this book to treasure and learn from. Thanks! Hi I’m so glad I have come across this resource. I’m current in the process of realising my need to self regulate around my two children, so this book would be great. Also I loved the idea of coaching my children, sometimes I manage this well and can see the benefits of this skill. So I’d love to learn more about it. Thank you for your wisdom. My 27-month old daughter is really ramping it up with tantrums lately and I think both my husband and I would benefit from focusing on reconnecting rather than slipping into a controlling standoff (hello, carseat refusal?). Would love this book because my husband and I are struggling with the two older kids listening to us. I learned on the short video intro about the marriage of empathy and limitations. I know children need boundaries but how to do that without seeming like you are trying to control them? Looking for some fresh insight. I am a mom of an incredibly busy and sensitive boy. I have been the primary parent as my partner works and money is tight (I stopped working to raise our son) so help is not an option (no family close by either). I’ve also recently lost my mom and it has brought up a lot ‘of stuff’…I am not usually one to yell, but every now and again, I do…I’m always looking for suggestions and ideas on how to be the best parent I can be. Thank you!